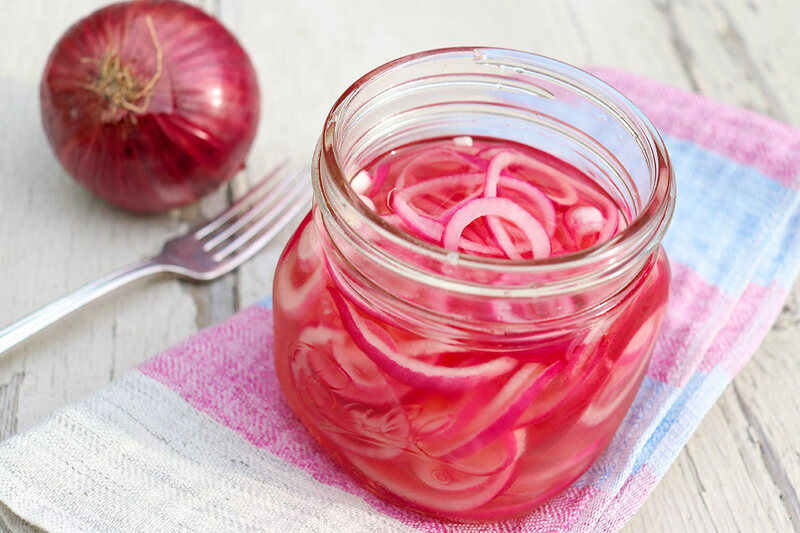 Quick Pickled Red Onions add a punch of color and flavor to a variety of meats, tacos, sandwiches, salads, and more. This easy-to-make condiment also happens to be evidence that delicious recipes can be found in the most unexpected places! College dining services have come a long way since I was in school, that’s for sure! Most schools these days cater to a variety of dietary and religious needs, from vegan and gluten-free to kosher and halal. Ethnic food stations are commonplace and there’s often a push towards local ingredients. Words like “from scratch”, “sustainable”, and “fair trade” are the new standard, and many colleges and universities proudly serve produce from their own gardens. After a tour at Bowdoin College with my younger son last summer, we were encouraged to grab lunch in the dining hall, where I filled my plate with a rainbow of salad bar options. After a few bites, I went back for more of one particularly memorable ingredient: pickled onions. As I heaped the vibrant pink ringlets onto my plate, I chatted with one of the dining hall employees and learned that most of the crisp greens, colorful veggies, and fragrant herbs came from campus gardens. All of the dressings, including the fresh basil vinaigrette I had chosen, were homemade daily, and the staff clearly took pride in the all that they served. Back at our table, my family thought it was mildly funny that I was most enthralled with the onions, so I insisted they taste them. They agreed that these were altogether different than the typical salad bar onions and were ultimately grateful when Jesse, one of the supervisors, shared the recipe. Because I cook for a small family, not hundreds of students, I scaled the recipe down dramatically. That said, the simple recipe keeps in the refrigerator for weeks and need not be canned. For added ease, additional onion slices can be added to the brine when the initial batch runs out. In an effort to reduce the added sugar as much as possible, I tried the recipe with a range of lesser amounts. All of my tasters preferred the flavor of the recipe with the amount stated below. The sugar tames the sharpness of the onions, but keep in mind that most of that sugar remains in the brine. Between the shocking pink color and zesty flavor, these onions brighten a variety of dishes. Try them on green salads, burgers, tacos, grilled fish and meats, pulled pork, and mayo-based salads like potato, egg, or macaroni. As an added bonus, all of the easy recipes from the past few weeks—the Spanish rice, cumin lime coleslaw, creamy avocado lime sauce (classic guacamole works well, too! 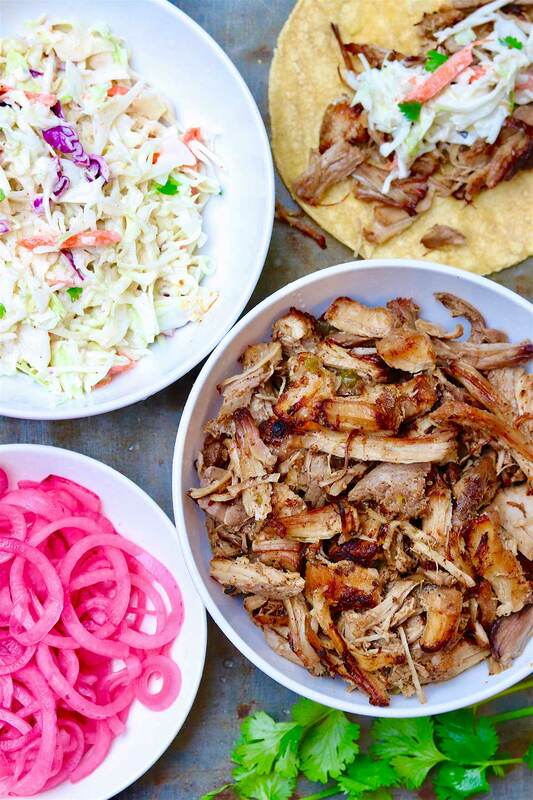 ), and crispy pork carnitas—can be incorporated into one casual yet company-worthy dish. I start with a base of rice, and then layer on some pork and coleslaw. From there, you can top as you would your favorite burrito bowl or taco, making sure to add a liberal helping of these pretty pickled onions on top! This easy-to-make condiment adds a punch of color and flavor to a variety of meats, tacos, sandwiches, salads, and more. Press down on the onions so all the pieces are submerged, and then let the mixture cool to room temperature. The onions will soften, so if they don’t all submerge right away, they will after sitting in the warm brine for several minutes. For storage, keep the onions in the brine and use a lidded, non-reactive (glass or ceramic) bowl or jar. (Most metals will react with the vinegar, and plastic will absorb the flavors.) The onions will taste good right away, but the flavor improves after several hours in the fridge and even more over the first day or two. The onions will keep, refrigerated, for 2-3 weeks. *White wine vinegar or apple cider vinegar could be used, but Bowdoin’s “secret” is the rice vinegar. **Sugar can be decreased, but keep in mind that most of the sugar remains in the brine. I’ve made versions with less sugar, which become sharper and tangier as the amount of sugar in decreased. ***I use McCormick’s pickling spice, which can be found in the baking aisle with the rest of the dried herbs and spices. 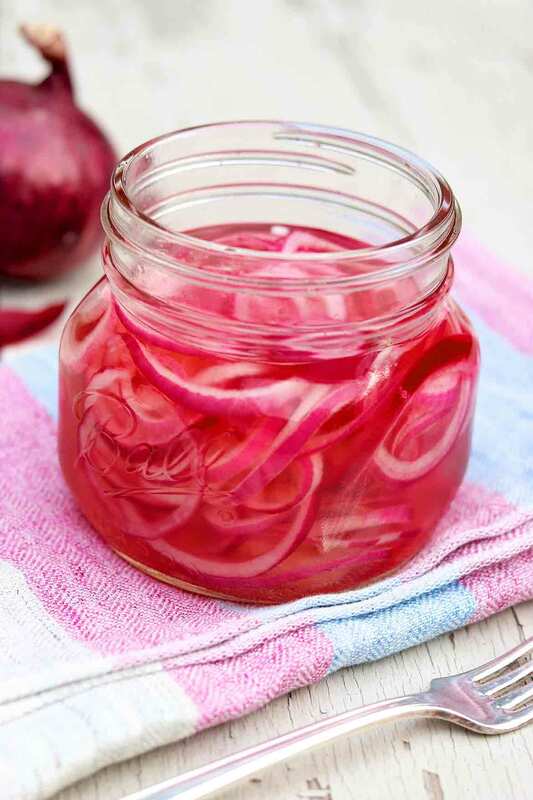 Very thinly slicing the onions–about 1/4-inch thick–allows the brine to be absorbed quickly and yields pickled onions with just the right texture. Conveniently, additional onion slices can be added to the brine once the initial batch is gone. Mmmm mmmm mmm. I will definitely try these soon! I make quick-pickled radishes using rice wine vinegar and they are also delicious. The brine tames the bite—the only downside is that they develop a *bit* of a smell after a couple of days in the fridge but it doesn’t affect the flavor. They are tasty! 🙂 I love the idea of pickling radishes, and my radish-and-pickle-loving husband would most definitely be a fan. These onions don’t smell particularly funny. Perhaps the radishes are unique in that way! Ann, these are incredible! I made them last week, and since then we had them with tuna salad sandwiches (made with avocado instead of mayo, fresh dill, and capers) and with borracho beans and cornmeal dumplings. What a great recipe. When we finish these up, I’m going to try adding thinly cut carrots to the brine. I’ll let you know how it works. Thanks Ann! You’re making me hungry. It’s almost lunchtime and I’d like some of that tuna salad! I’m delighted you’ve been enjoying the pickled onions and appreciate your feedback. Carrots sound like a wonderful addition. Feel free to report back! These are awesome! Seriously never imagined onions could taste so good! Use a Nutella glass jar. Over here in Europe they sell Nutella in glass jars with a plastic lid, and both the jar and the lid go into the dish washer – you won’t have to deal with a rusty lid. I have to have these in the fridge now. They’re so good on so many things! Coincidently, I just made another batch today for a cookout tomorrow. They do add a little something special to so many things! I made this and it was every bit as good as promised!! I’m delighted you enjoyed them, Helen!